I spent this rainy afternoon looking at You Tube videos! I'm totally addicted...if it's not that it's Pinterest!!! Check out Cynde Whitlow's video to see what all I learned this afternoon! that I was using dripped a big blob on the leaf!!!! see the dots along the edge of the flowers? It still looked like crap so I stamped another small flower , colored it and fussy cut it. ...popped it over the blob and Hurray.. I didn't have to throw the whole thing in the trash! So now I can link this up to Simon Says Stamp Wednesday Challenge. Love how you colored the bird, and such a beautiful design. Love the inked oval! Caught my eye... nice job covering up boo-boos as we hate throwing out ANYTHING! Love the coloring! 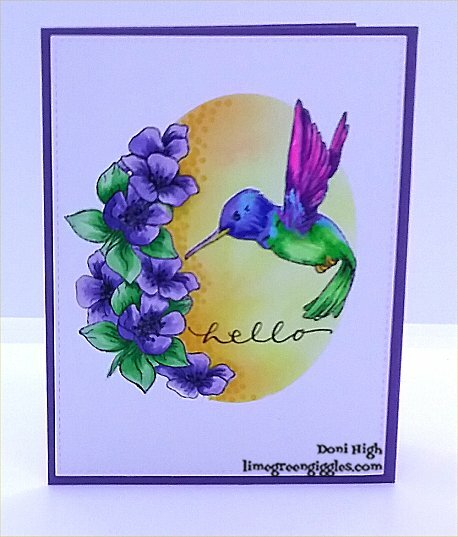 I love your colorful hummingbird, Doni, what a pretty card! Thank you for sharing it with us at the Simon Says Stamp Wednesday challenge! Looks fantastic Doni and I ohh so know that horrific feeling when colouring away and the dreaded blob of dark colour just plops down onto the nearly finished project in the worst possible spot. So glad you were able to save the day because thats much better than having to start again.